I realize now that the Volkswagen I bought under an oak tree in Sacramento has been here to New York City for a few months now and I haven’t written anything about it. Let me tell you, it is an incomparable joy. I have so many sweet memories with this car when I decided to fly out to California, find and buy it off of Craigslist a day after landing, then set off to drive it home to NYC with next to no knowledge of what was deeply, fundamentally wrong with it. I remember it breaking down the first time I took it around the block. I remember it breaking down the first time I tried to take it out of town. I remember it breaking down before it left the Central Valley. I remember it breaking down in the foothills leaving the Central Valley. I remember it breaking down in the mountains the following day. I remember it breaking down at a diner on the far side of the mountains the day after that. I remember it breaking down getting into Arizona, and New Mexico, and in the middle of the night in Texas while a state trooper pulled me over. I remember it dropping a valve in between Memphis and Little Rock, where it sat for a year waiting on a new engine. But with its new, bigger-than-stock 1776cc engine it is a happy little car. It gleefully ate up the highway miles from Arkansas to Memphis to North Carolina, only hiccupping once or twice along the way. It wasn’t much. Well, it was enough to get me mugged, but it wasn’t all that bad. And now the car is back here in the city, where it has its own toasty garage spot to keep it safe from New York City salt. 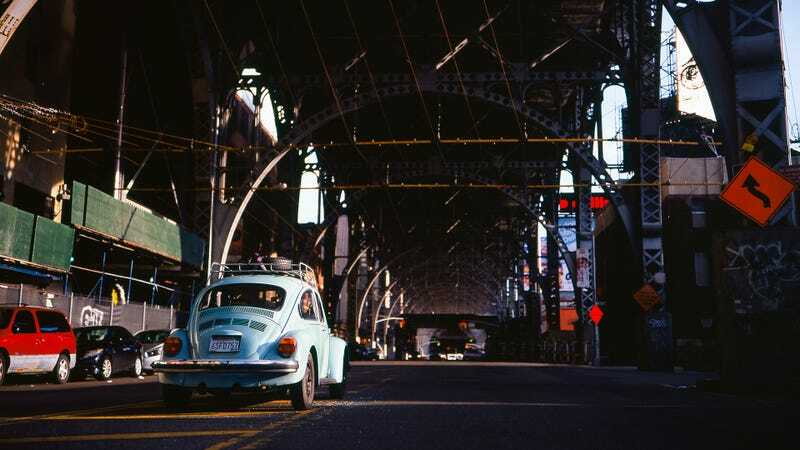 (Its gigantic bumpers keep it safe from New York City traffic.) I took a day off the other week to go for a drive up the Hudson Valley, to see some familiar country roads and go for a little hike. I have rarely felt so happy and accomplished seeing it cruise past little New York ponds. It felt like yesterday when this same car had cruised past Mono Lake in the waning moments before the sun dipped below the Sierras. It has been so nice just to use this VW as a car. I even washed and detailed it, something I’d never have done in my rust-and-primer Baja Bug. People smile as it putters past them on the street, a blissful blue blot in their day. I could pinch myself, how dreamlike and easy this car is to use. Its almost hourly problems are like echoes from a past life. What was that clicking sound? Oh, the clutch cable just snapped in the middle of stop-and-go traffic on 17th street.